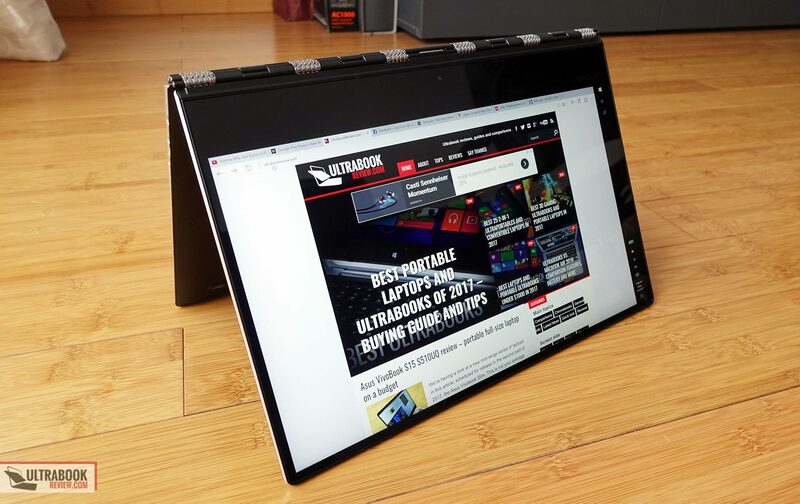 Summary: As long as you don't plan to use this laptop for continuous demanding loads, the Lenovo Yoga 910 is one of the best premium convertibles in its niche. 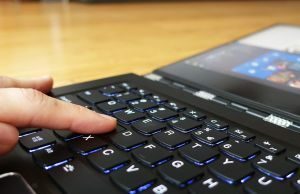 The big battery, excellent keyboard/trackpad, larger 13.9" screen and splendid build quality are its main selling points, but the the speakers or the everyday use performance are not far off. 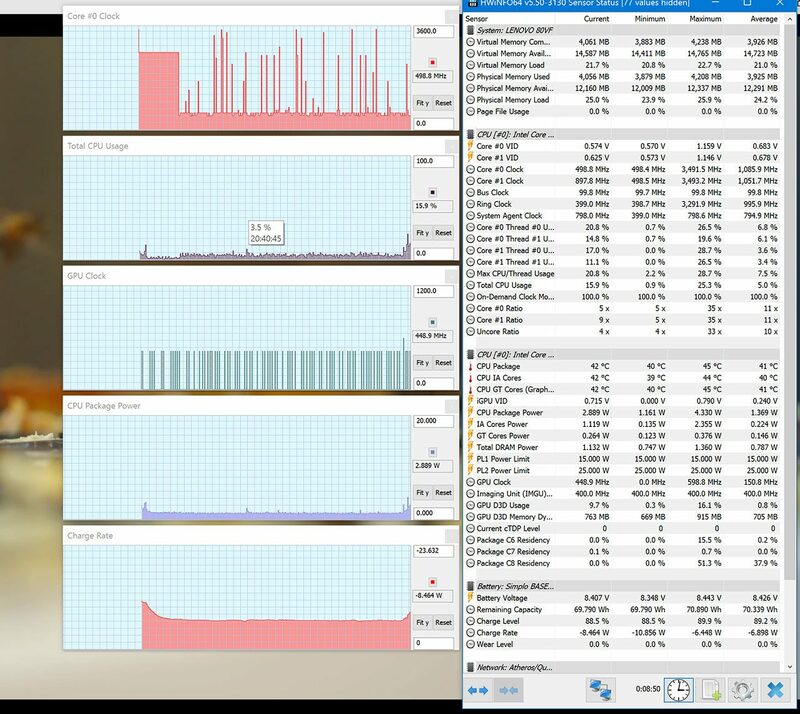 Just keep in mind this computer is a little bigger than others in its class, runs rather warm despite the fact that the fans inside spin all the time, and lacks a digitizer and Thunderbolt 3 port. Read on for the whole story. 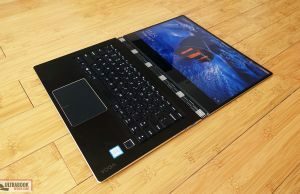 There are quite a few premium ultraportables with convertible screens on the market, and this article is about one of better options in the segment: the Lenovo Yoga 910-13IKB. 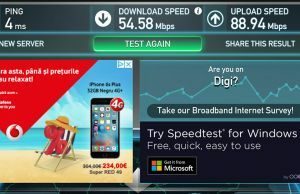 It’s not a new product, it was in fact launched back in 2016, but it’s still an up-to-date option and I finally got to spend some time with it, so you’ll find my impressions below, with the goods and the quirks. 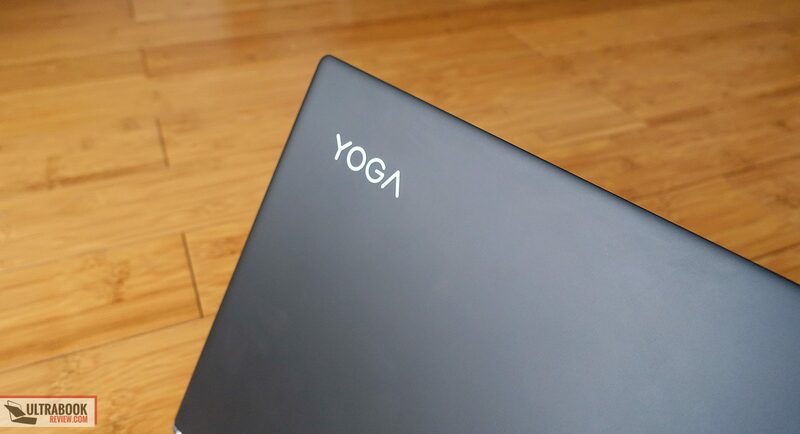 The Yoga 910 is a computer meant for daily use, for browsing and documents and movies and music, it’s not a high performance laptop for demanding tasks or games. 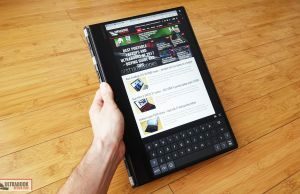 It is however extremely well built and as portable as it can be without sacrificing practicality. 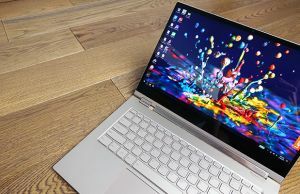 The high resolution 13.9-inch screen and large battery are among its main selling points. 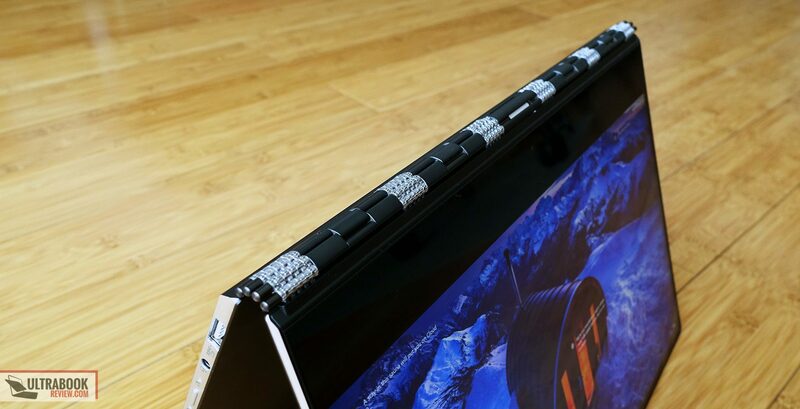 But is The Yoga 910 worth the high price Lenovo asks for it? Read on to find out. 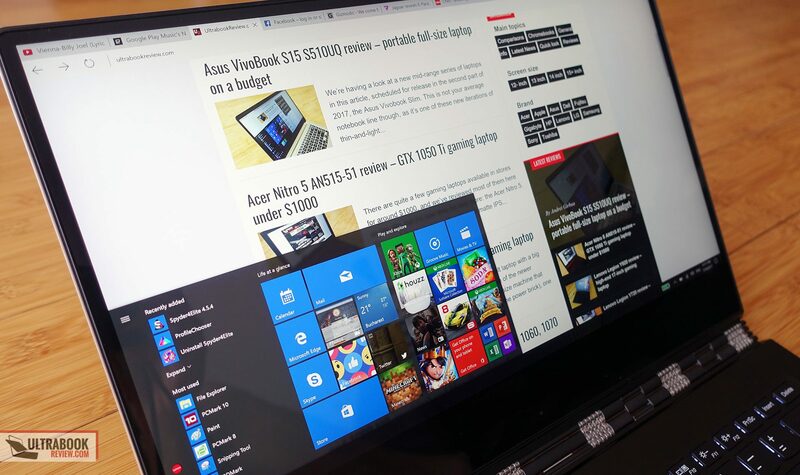 I have to stress on this aspect: this device is built like a tank, despite being only .56″ in its thickest point. 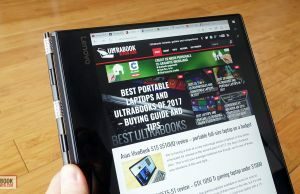 The unibody metallic construction just makes sure there’s no give or flex in either the lid or the main-body, so when it comes to build quality, this gets an A+. The matte anodized finishing feels great to the touch and looks exquisite on this darker variant we got here, with very discrete branding elements on the lid and interior. In fact, I can say this is one of my favorite notebooks in terms of looks and feel. 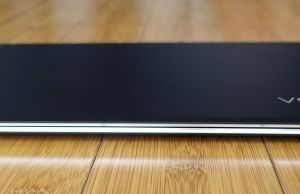 However, dark metal surfaces show smudges easily, so the more practical among you will probably opt for either the Silver or Gold variants instead. 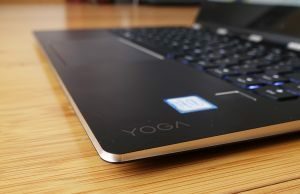 You should know that the Yoga 910 is a little bigger and heavier than other premium convertibles like the HP Spectre X360 or the Asus Zenbook Flip S, primarily because it comes with a bigger 13.9″ screen (as opposed to the 13.3″ screens on most alternatives) and larger 78 Wh battery. 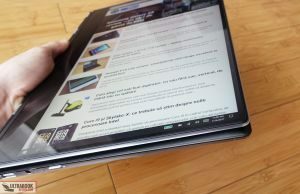 It weighs 3.05 lbs, which is still light enough for me, but the large bottom bezel and the hinge does make it quite tall. 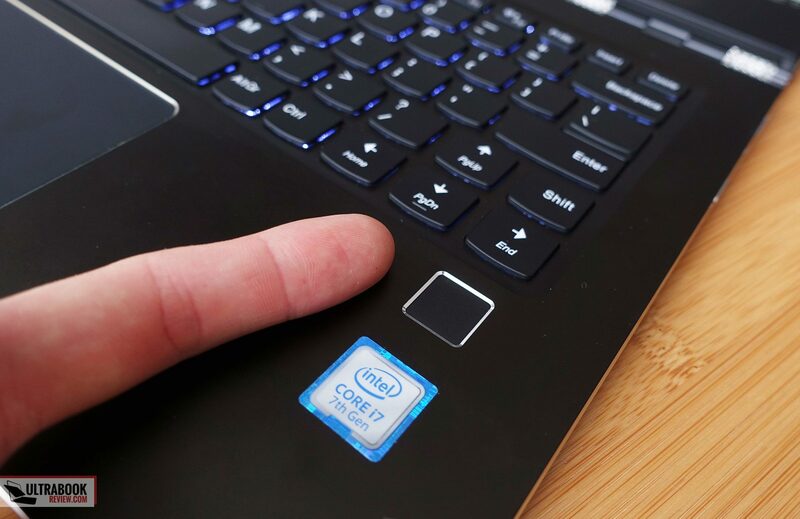 That’s not an issue as long as you use this as a standard laptop, where the bigger footprint leaves room for a spacious interior (and a fingerprint sensor on the right side), but can be in Tablet and Tent modes. For me, one of the benefits of owning a convertible is the ability to watch movies in Tent mode, but with this one it’s somewhat weird, as the lateral and top bezels are minuscule, while the bottom bezel is much bigger, as you can see in the pictures below. 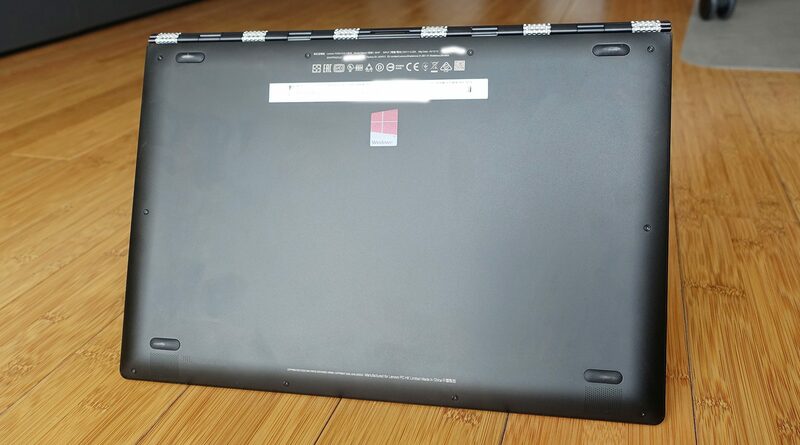 At least it allows for a proper handle in tablet mode, corroborated with the hinge. 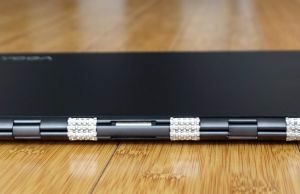 The hinge is a nice update from the first time I’ve seen this design on the Yoga 3 Pro a few years ago, it’s better built and no longer rattles like a watch band. 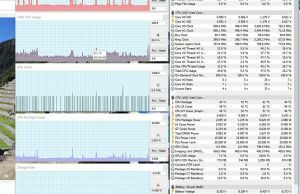 It also works pretty much flawlessly. 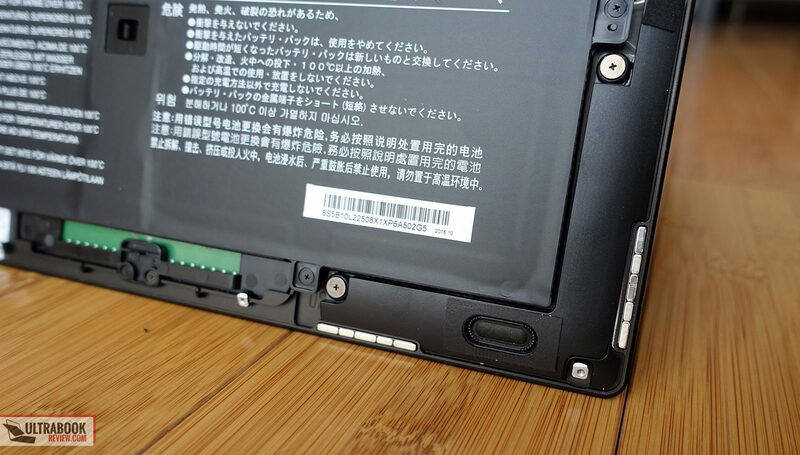 It allows to lift the screen with a single hand and smoothly adjust between modes, and it keeps the screen perfectly on top of the lower half in Tablet mode. 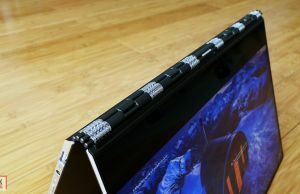 The screen and main-body’s machined milled inner edges are rather sharp though and will surely bite fingertips and break nails. 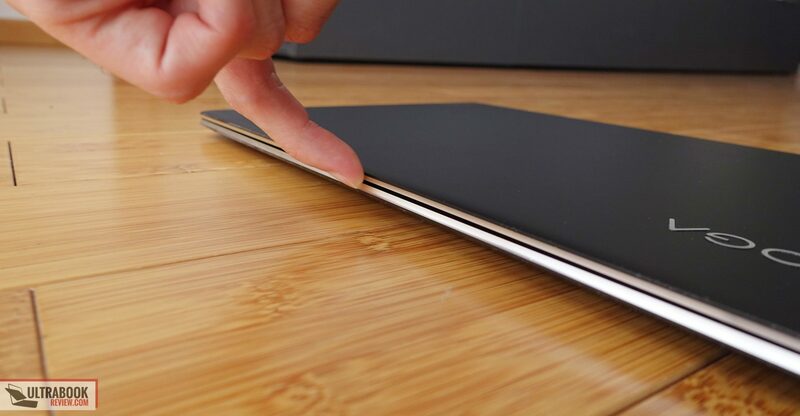 There’s also no crease to grab the screen from when opening it, which again means you’ll have to grab from those sharp edges. 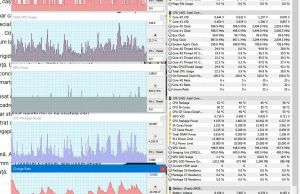 This is however my only true complain when it comes to how this laptop is made and how it feels in daily use. Otherwise, it’s excellent as a notebook, nice as a Tablet and alright in Tent mode. The bottom gets four grippy rubber feet and the speakers. 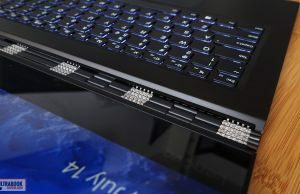 There are no cuts for air-intake, which instead happens through the keyboard, while hot air is pushed by two small fans through some tiny grills behind the hinge. 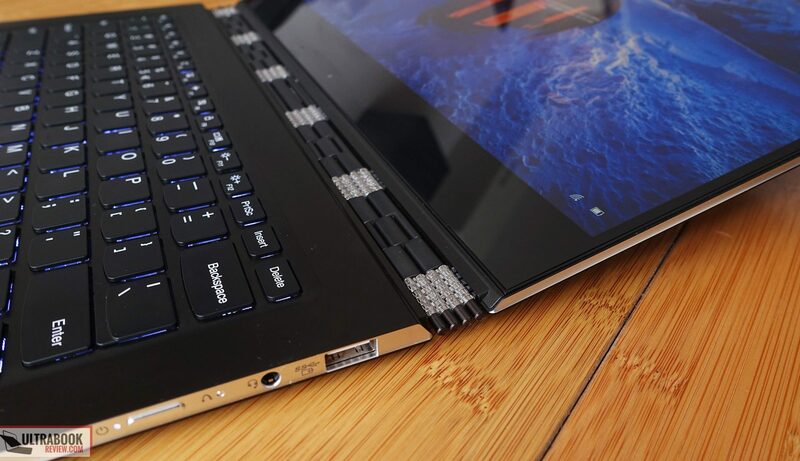 The IO is rather limited, with only one USB Type-A port, two USB Type-C ports and a headphone jack. None of those support Thunderbolt 3, which somewhat shows this product’s age, as many competitors do these days. 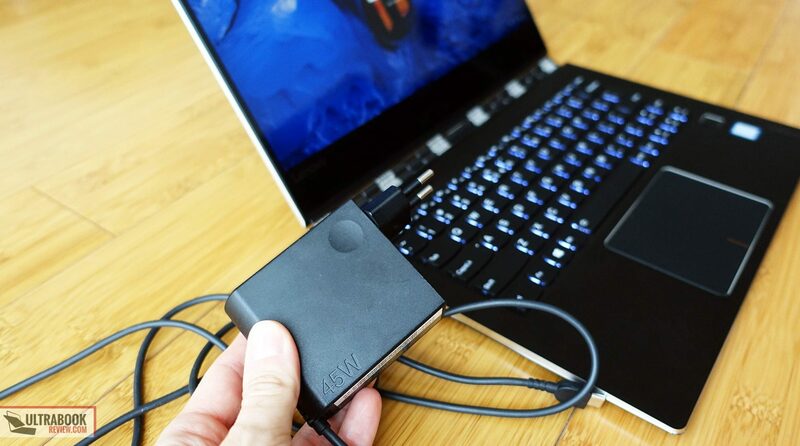 There are also no adapters included in the pack, which means you’ll need to buy at least and USB-C to HDMI adapter to output video, if not one of the available hubs with extra ports and a card-reader. 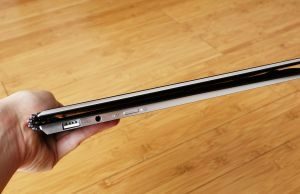 All in all, the lack of full-size ports is pretty common with thin and light laptops these days, and at least there’s a full-size USB on this one. 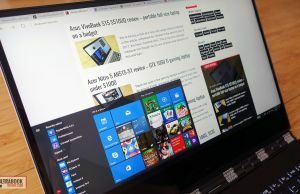 The lack of Thunderbolt 3 support on the other hand can be limiting for some of you and will prevent you from hooking up a 4K 60Hz external display, for example. 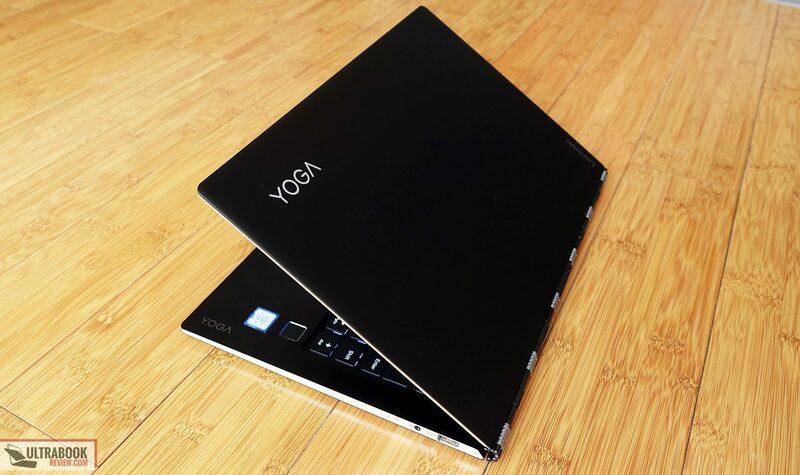 The Yoga 910 gets a 13.9-inch touchscreen without an active digitizer and active pen support, which is again a feature the competition offers. 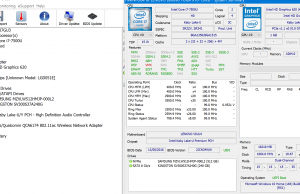 It’s bigger than the standard 13.3″ screens on other convertibles though, so at least you get a larger working area. 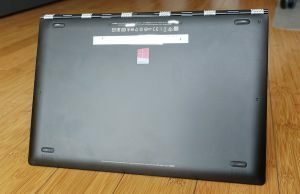 Lenovo offers two screen options for this laptop, both IPS panels, but one with FHD resolution and a higher density UHD variant. 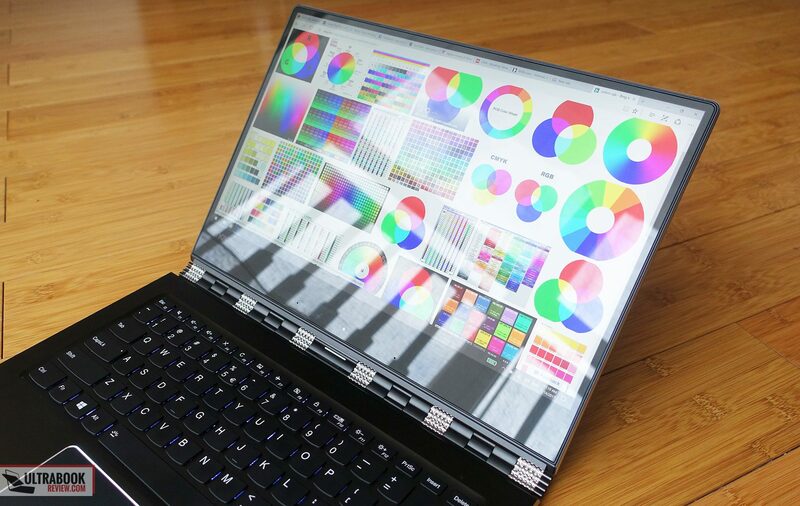 We got to test the later and it’s a really good panel, with solid features and no light bleeding. 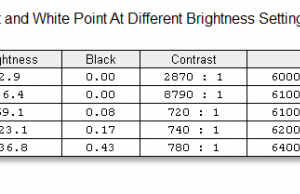 Color uniformity is rather skewed in the lower-left corner though and gray levels are somewhat flawed out of the box as well, but you can address them to some extent with this calibrated color profile. 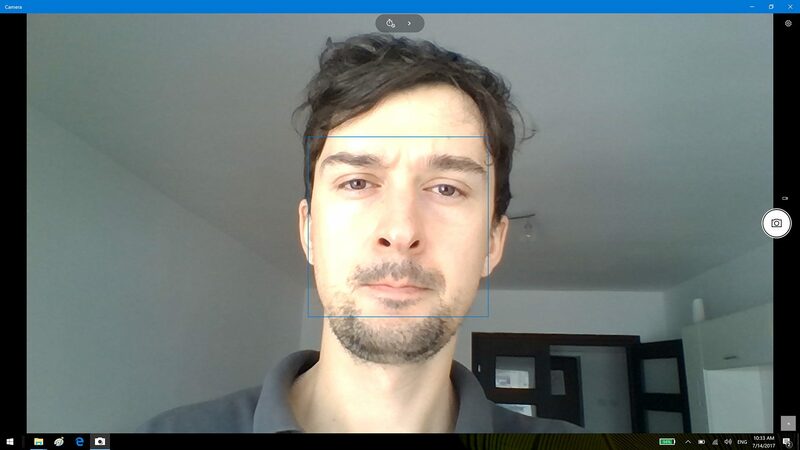 More details below (taken with a Spyder4 sensor). 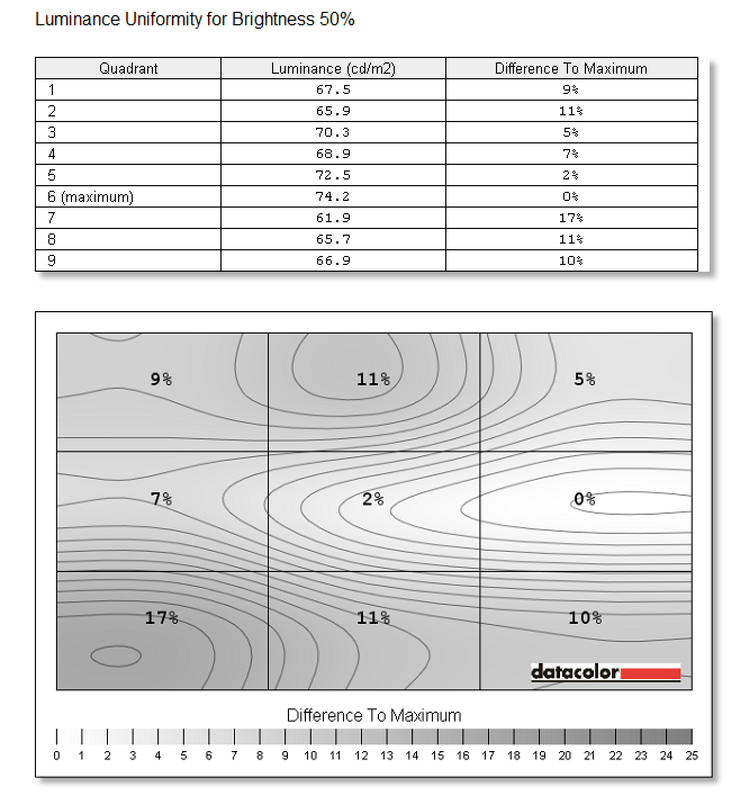 Average DeltaE: 2.00 uncalibrated, 1.09 calibrated. Regular touch works flawlessly on this laptop and the screen flips back to 360 degrees, like on most other convertibles. 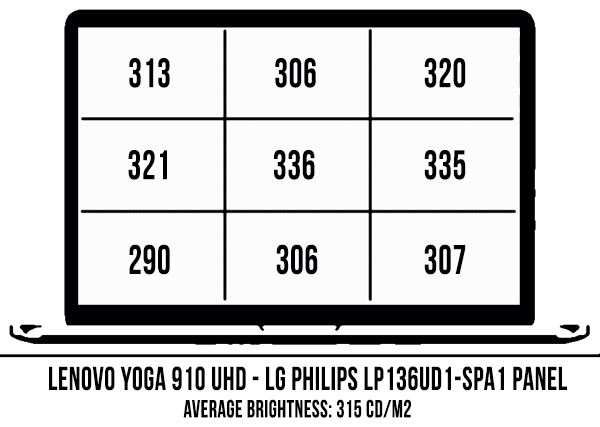 Potential buyers should ask themselves if they should opt for the UHD or the FHD panel. 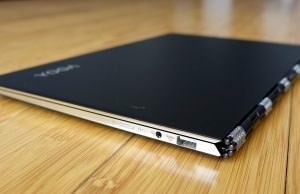 The former is a great, sharp option and the latter is a little more limited in terms of brightness and color coverage, but still a good pick overall, as well as a cheaper and less power hungry. More about that in a later section. 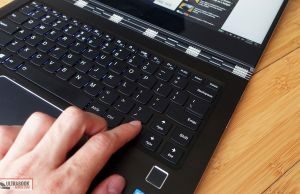 After typing several thousands of words on this keyboard I can easily say it’s one of my favorites available on an ultraportable these days. 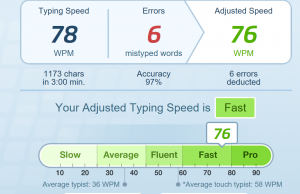 The layout is nearly spotless, with proper sized and spaced key and full-size arrows as well, except for the Right Shift which is tiny and oddly placed. 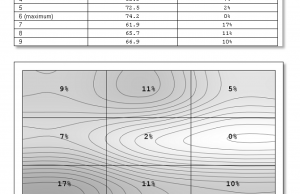 I don’t use right Shift though, so that wasn’t an issue for me. 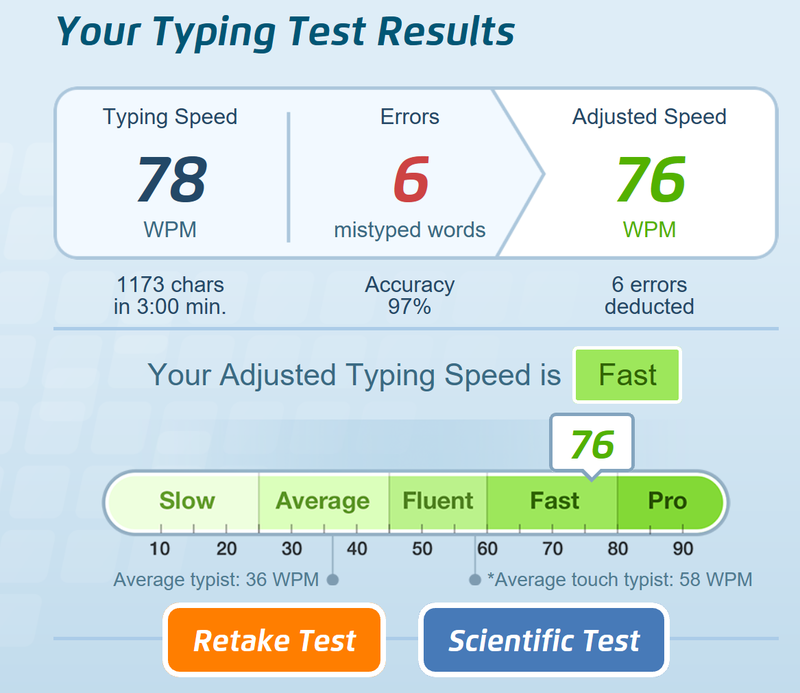 The keys’ feedback was just right up my alley though, and although the stroke is rather short (which could steer some of you away), I was able to type fast and more accurately than with most other laptops I’ve ever reviewed. 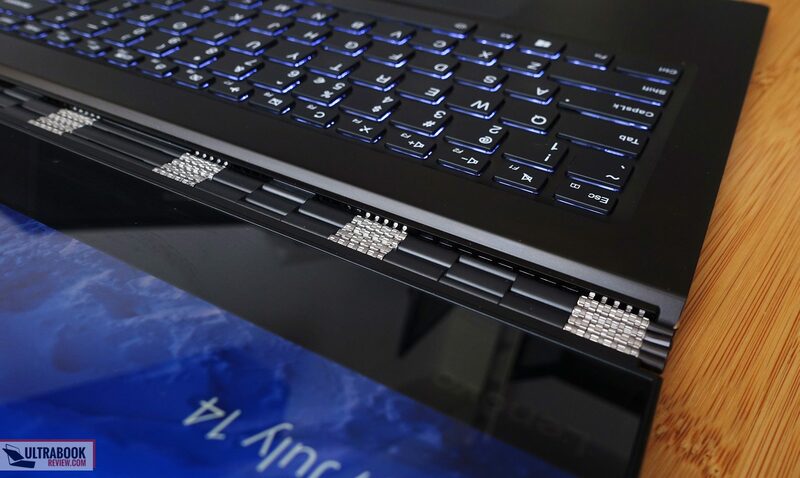 This keyboard is also silent and backlit, with two brightness levels to choose from. As far as mouse goes, Lenovo went with a glass Synpatics clickpad here and there’s just nothing to complain about how it feels and performs. 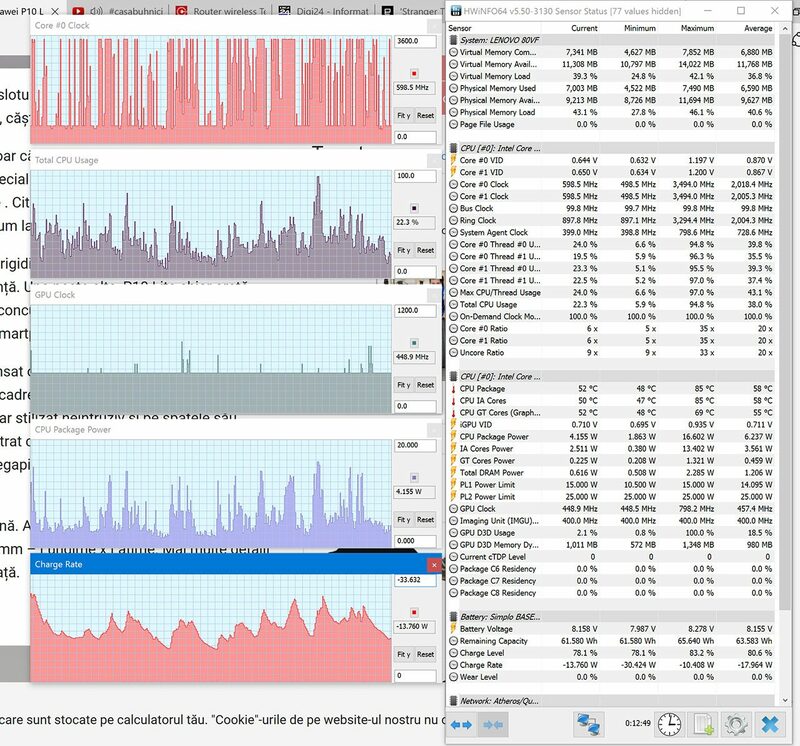 It’s smooth, responsive and reliable, and even the physical clicks have a nice feedback and sound. 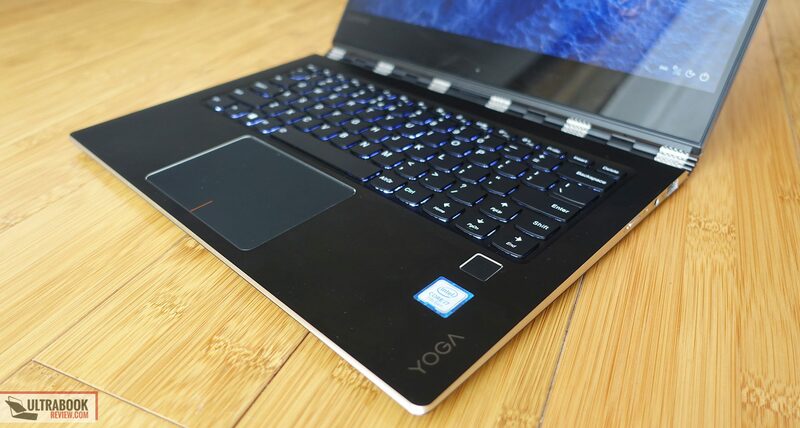 The Yoga 910 is available in a few different variants and we got to test one of the higher end configurations, with a Core i7-7500U processor, 16 GB of RAM and a 512 GB NVMe SSD. 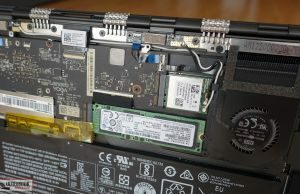 The CPU and RAM are soldered on the motherboard, so you must make sure you pick them right from the beginning. The storage, battery and wireless chip are accessible by removing the back panel, which is hold in place by a handful of visible screws and comes away easily once you remove them. 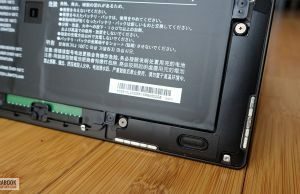 You might need to pull the panel a little firmer, there’s a plastic clip holding it attached to the main body that gives some resistance. 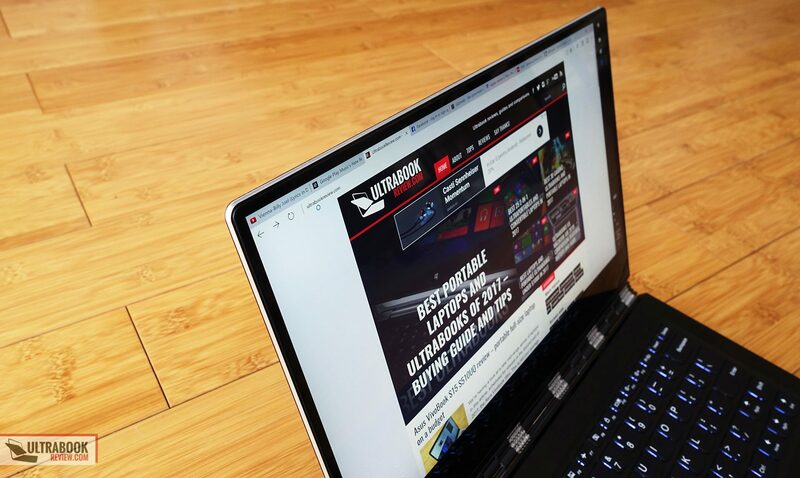 As far as the available configurations go, I’d reckon most people will be fine with the Core i5-7200U CPU and 8 GB of RAM, perfectly adequate to handle handle daily activities and multimedia content. 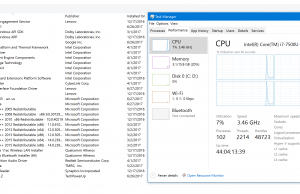 The i7 and the extra RAM could be an option in case you plan to run more demanding loads on this laptop, like CAD or maybe Photoshop or Premiere or VMWare or the like. 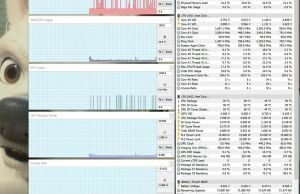 The key word in that sentence is “could”, because in reality this laptop is not able to sustain constant high-loads for a long period of time. 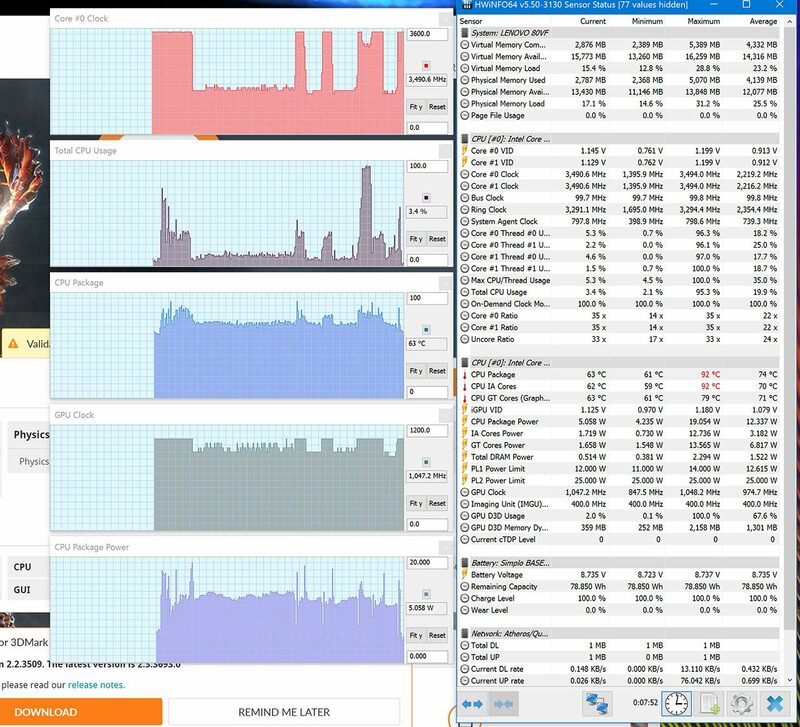 That’s visible in the pictures below, where we ran some benchmarks and some games on our test sample and noticed CPU throttling in all cases. 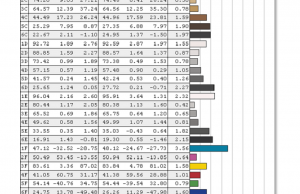 The benchmark results are below, in case you’re interested in hard numbers. 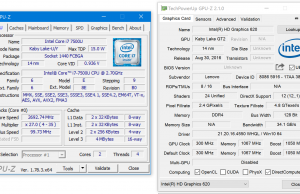 They’re somewhat affected by the throttling of our review unit, so take them with a grain of salt, there’s a chance other samples perform better. 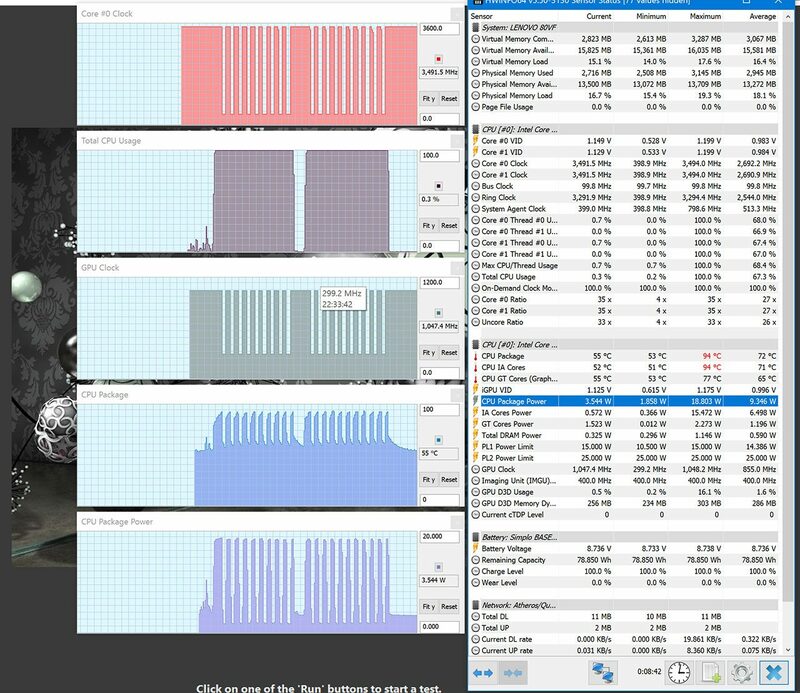 x264 HD Benchmark 4.0 32-bit: Pass 1 – 104.81 fps, Pass 2 – 18.86 fps. 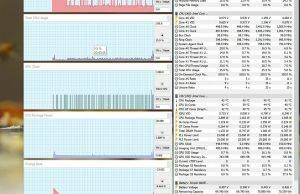 I’ve also added pictures that show speeds and temperatures with more standard everyday scenarios like browsing, editing documents and watching movies. 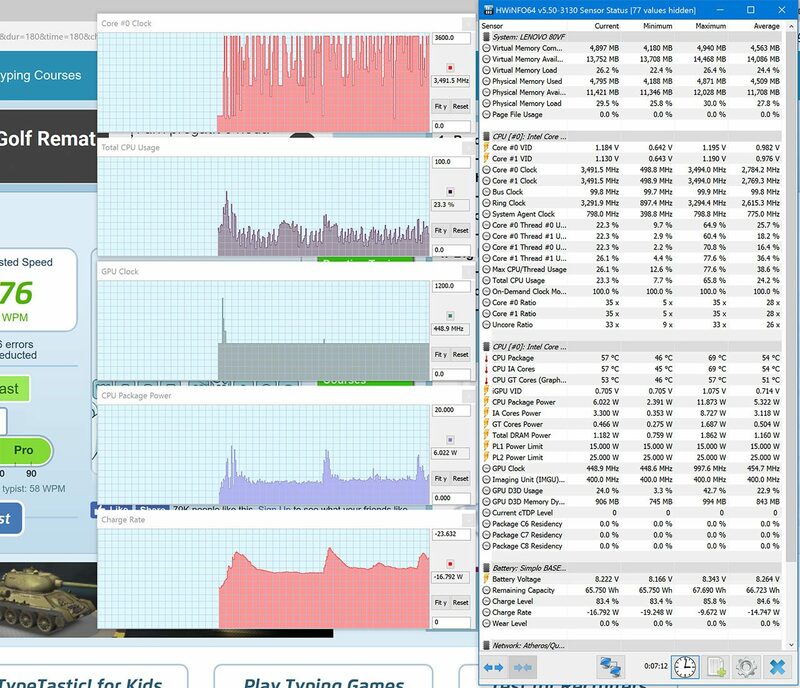 There are or course some ways you can tweak the performance under load by undervolting the CPU and even repasting it (which voids warranty), but if I were you I just wouldn’t buy this laptop for demanding loads and only consider it for everyday use, which is one more reason I’d recommend sticking with the cheaper and cooler running Core i5 configuration. 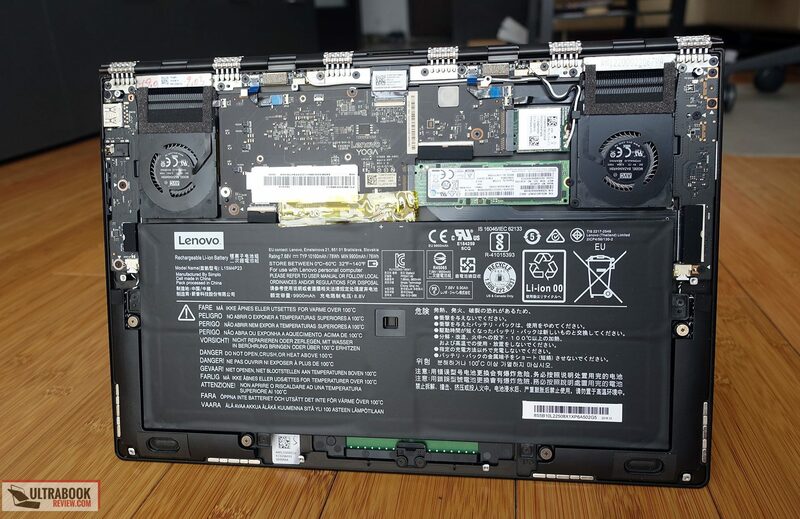 As far as the cooling on the Yoga goes, Lenovo uses a system with two small fans and heatpipes on top of the motherboard (so repasting would require a complete disassembly). The entire cooling is miniaturized to fit the laptop’s slim body and has very limited intake, given there are no intake cuts on the bottom, as well as limited exhaust through those tiny holes behind the hinge. 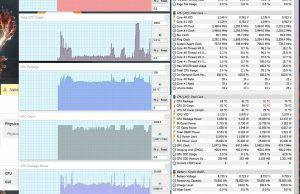 As a result, this laptop gets warm with daily multitasking and the fans have to spin all the time. 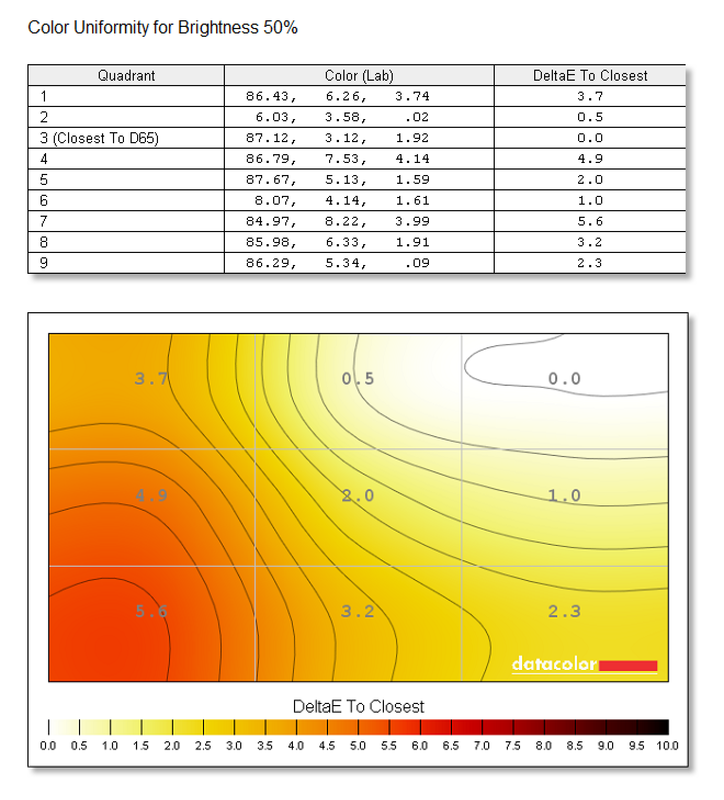 They’re not very loud, at 38-39 dB at head level, but have a rather high pitch sound that makes them stand out. 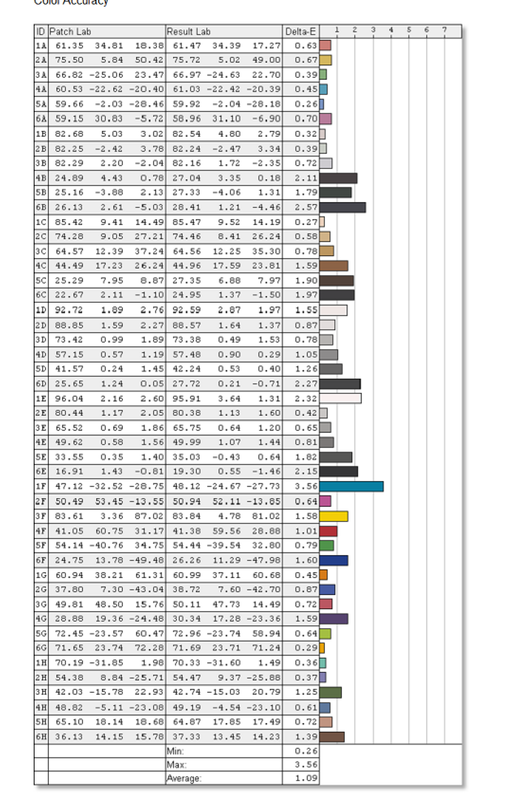 The picture below shows that the back and interior get fairly warm with multimedia use, and those numbers jump closer to 40s with everyday multitasking, which is a little high for my taste to be comfortable to use on the lap. Not unexpected though, given how thin this is. 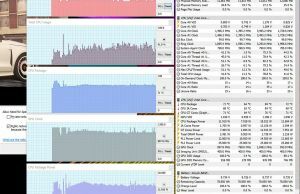 With games, the fans ramp up to about 42 dB and case temperatures jump up as well. 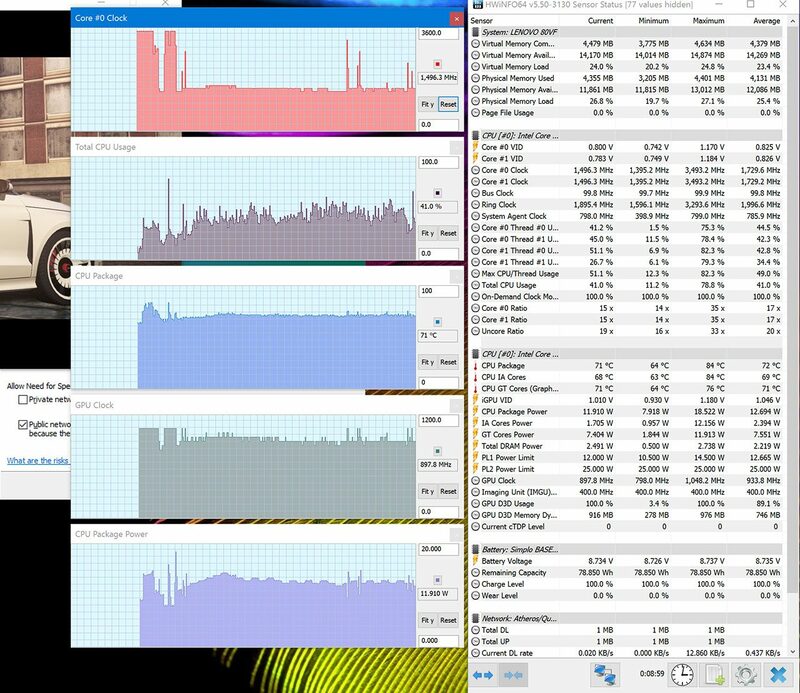 Other ultraportables run hotter in high loads though, but don’t forget both the CPU and GPU throttle here, so these temperatures would have been higher if they were to work at full capacity. 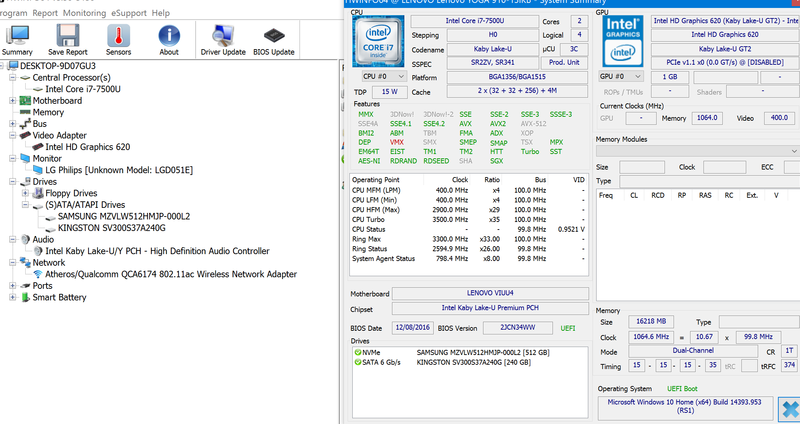 Connectivity wise there’s Wireless AC and Bluetooth 4.1 on this laptop. 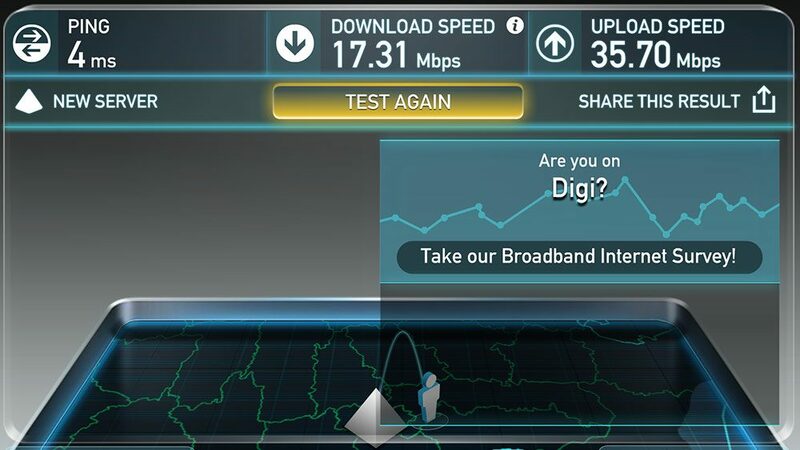 The included Qualcomm module worked flawlessly on our unit both near the router and at 30 feet with walls in between, where the speeds and signal strength dropped, but to still usable levels. 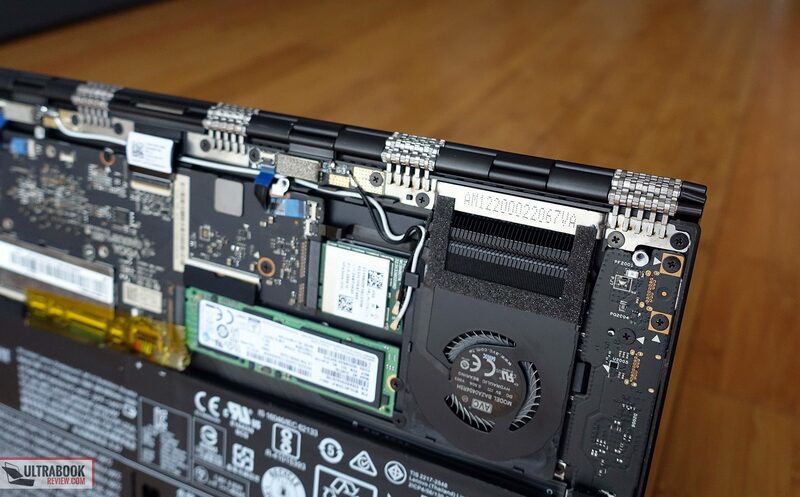 As far as the speakers go, these are surprisingly punchy for a laptop as thin as this one. They’re pretty loud at 80 dB at head level and sound rich, with clear sound, a fair amount of low end and no distortions at high volumes. I was afraid these would be easily muffled when having the laptop on the lap, due to their placement, but covering them doesn’t have a major impact. 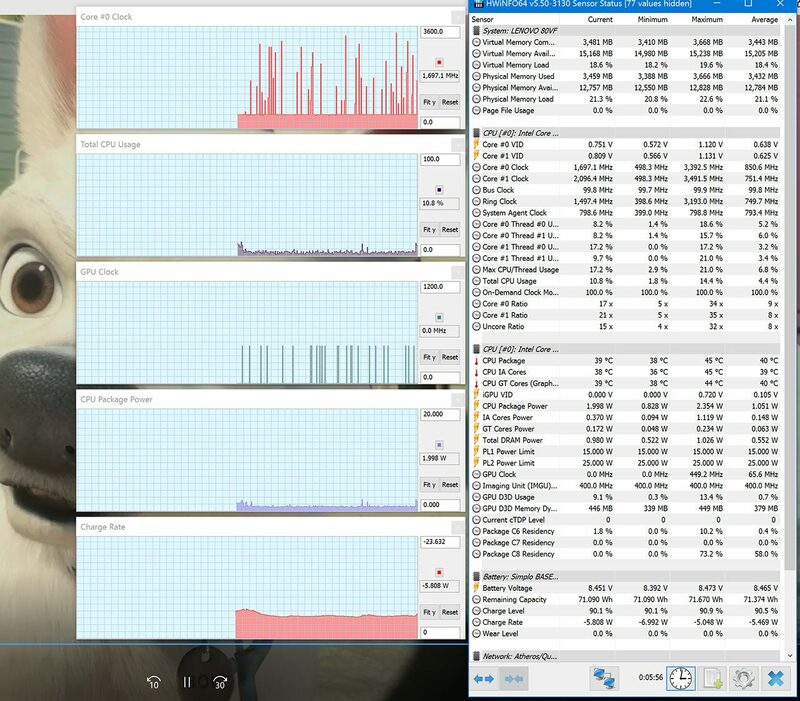 I also noticed they sound really well in Tablet mode, even better than in the others. The sound bouncing from the metallic lid seems to have a nice amplifying effect. 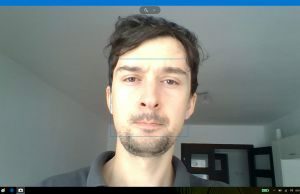 As for the webcam, there’s not much to brag about, it does its job but it’s as bad as most other HD webcams. It’s placed below the screen like on the Dell XPS, which means the person at the other end of the line will usually see you from the chin down if you actually want to look at the screen while chatting. 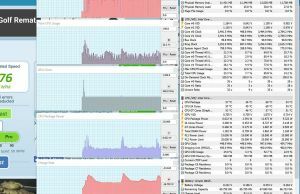 18 W (~4 h 20 min of use) – heavy browsing in Edge, Balanced Mode, screen at 30%, Wi-Fi ON. 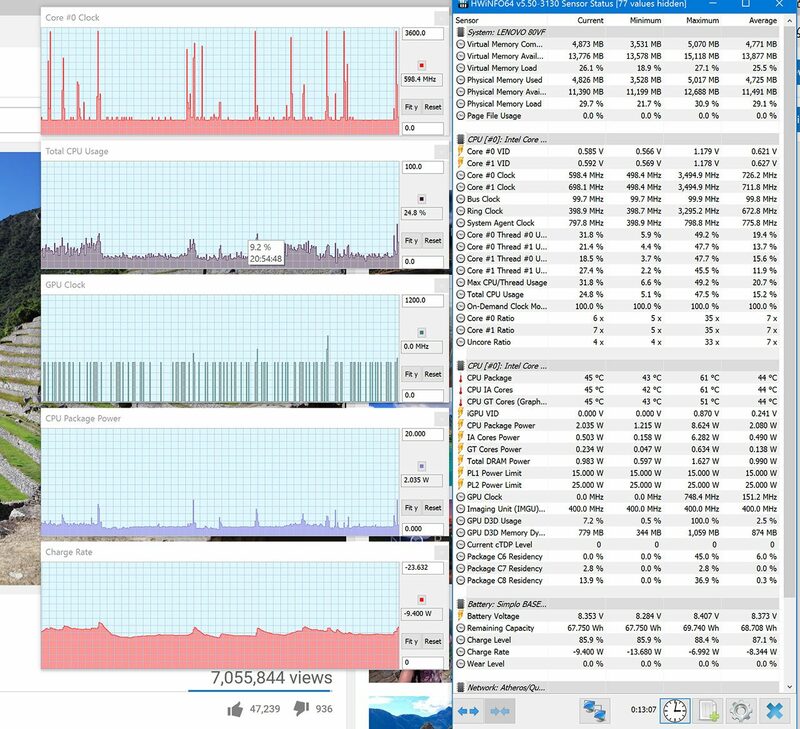 Heavy multitasking and browsing in general eats fast through the battery, but video playing on the other hand is much more efficient. The FHD screen will help improve battery life in daily multitasking. 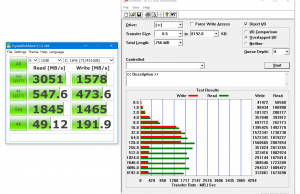 There’s a compact 45 Wh power brick with an USB-C tip included in the pack and a full charge takes close to 3 hours while using the laptop. The charger only weighs about .24 kg, cables included. 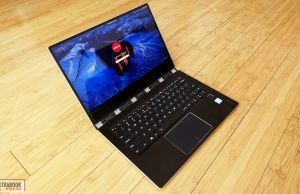 The Lenovo Yoga 910 starts at $1100 at the time of this post (July 2017) for a Core i5-7200U configuration with 8 GB of RAM, a 256 GB SSD and the FHD IPS screen, which in my opinion is the one that makes the most sense on this laptop. 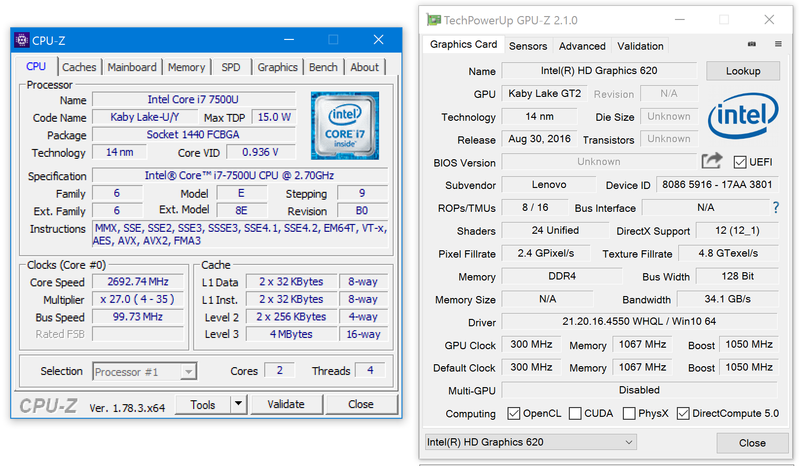 Updating to the Core i7 processor is going to cost $100 extra, while a configuration with the UHD screen, i7 CPU, 16 GB of RAM and a 512 GB SSD sells for around $1350, but given how our sample struggled to cool the i7 processor, it’s just not worth paying extra for imo. 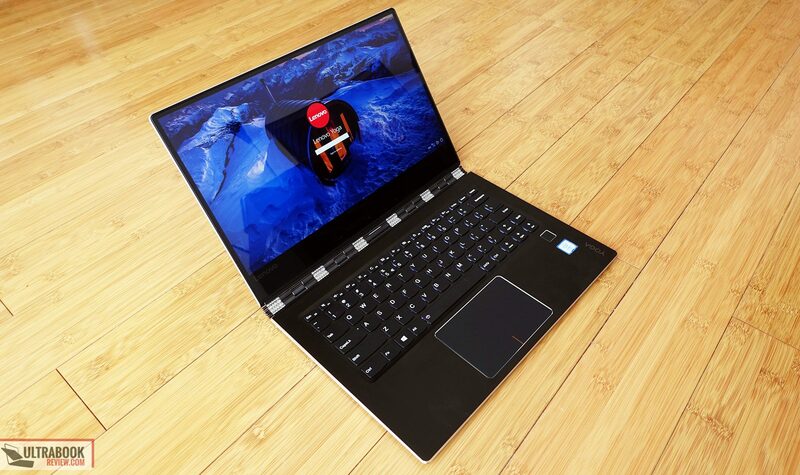 The UHD screen is sure nice though, but is not an option with i5 processors, so Lenovo pretty much forces potential buyers to upgrade to the i7 in order to get it. 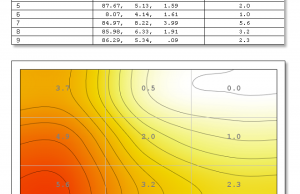 Follow this link for updated configurations and prices at the time you’re reading this post. 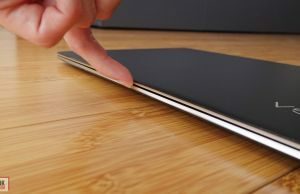 Drawing the line, the $1100 version of the Lenovo Yoga 910 is a really solid buy in its category. 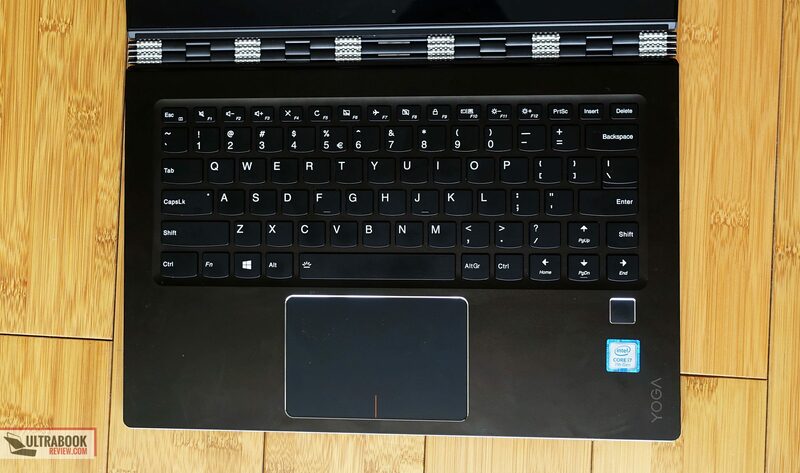 This kind of money will get you a very well built and good looking convertible laptop, a nice FHD IPS touchscreen, an excellent keyboard and the power to handle daily chores and multimedia content smoothly, as well as the battery capacity to keep going to for a long time. 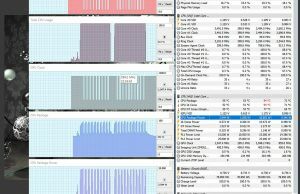 As for quirks, aside from those sharp edges, always active fans, warmish case temperatures and potential throttling in heavy loads, there’s nothing significant wrong about it. 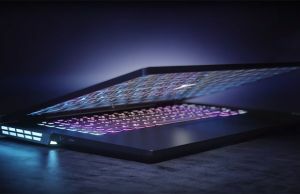 And keep in mind you already knew this is not a laptop for demanding loads, which pretty should strike out the potential loss of performance, since you’re not going to use it for demanding tasks anyway. 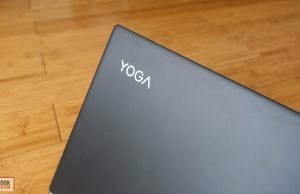 Lenovo X1 Yoga – starts at $1600 for a Core i5 configuration, gets a 14-inch FHD IPS or WQHD OLED screen with Pen support, LTE module, 56 Wh battery, 2x Thunderbolt 3 ports, 3.0 lbs and .69″ thick. They’re all more compact, offer pen support and some come with Thunderbolt 3 ports. 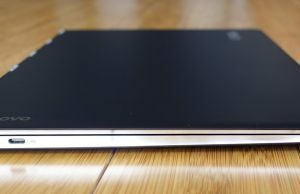 The HP Spectre x360 is still the best all-round package in the niche, and a highly appreciated product with no major flaws as you can see from our detailed review. 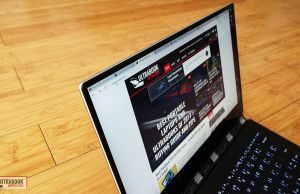 The Zenbook is light and slim, but sacrifices on battery life, while the X1 Yoga comes with the ThinkPad rugged build, LTE and an OLED screen, but is very expensive. 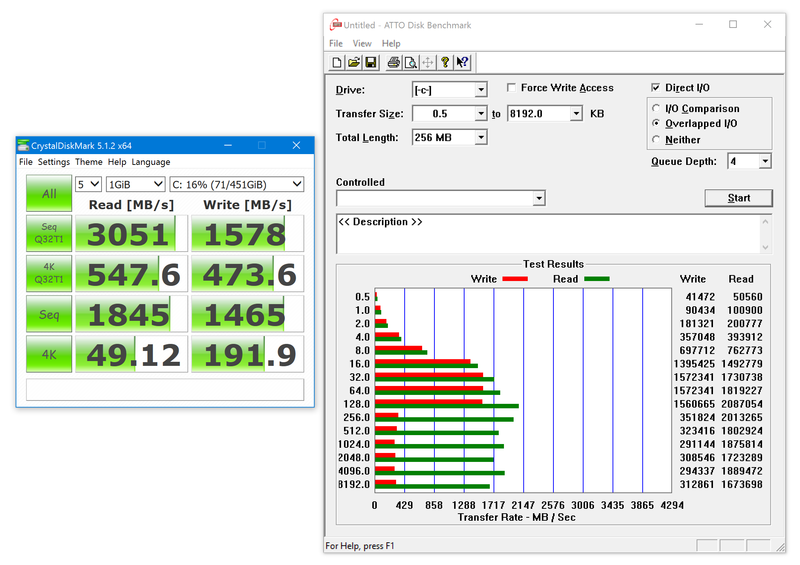 It’s also worth mentioning that all these options get smaller batteries than the Yoga 910 and none are actually capable of properly sustaining full-loads on a Core i7 configuration, due to their very thin builds. 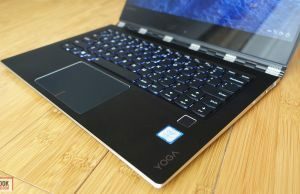 There’s also the option to consider one of the mid-tier convertibles as well, with startign prices of around $800 and mostly similar hardware and features, like the 13-inch Lenovo Yoga 720 or the Asus Zenbook Flip UX360UA. 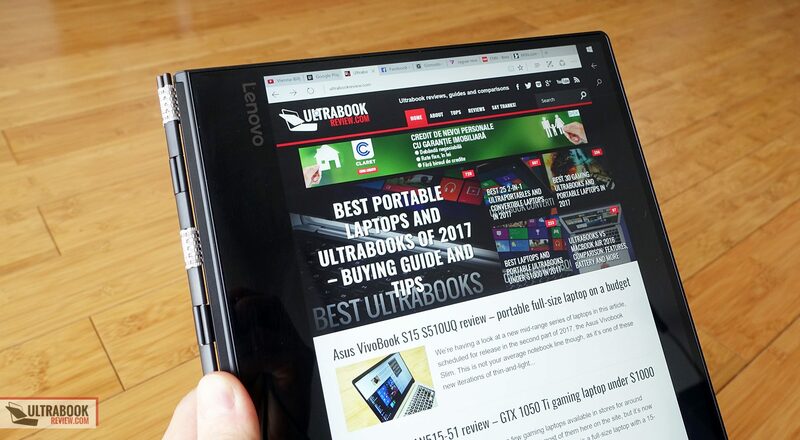 So all in all, if you’d rather get a slightly bigger screen and battery on your premium ultraportable, the Lenovo Yoga 910 is the one for you. On the other hand, if you want a 2-in-1 with pen support and a small footprint, there are nicer options out there. 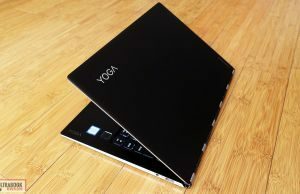 With that in mind we’ll wrap this up here, but the comments section below is open for your feedback and questions on this Lenovo Yoga 910, and we’re around to help out if we can. 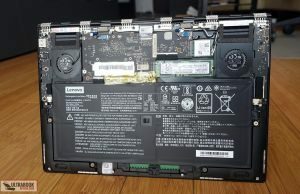 Love my Lenovo 910. 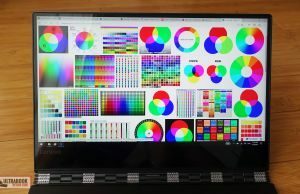 But would like to connect it to my 27" monitor for larger display while working in my office. 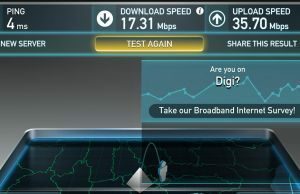 What do I need to do to get that to work. 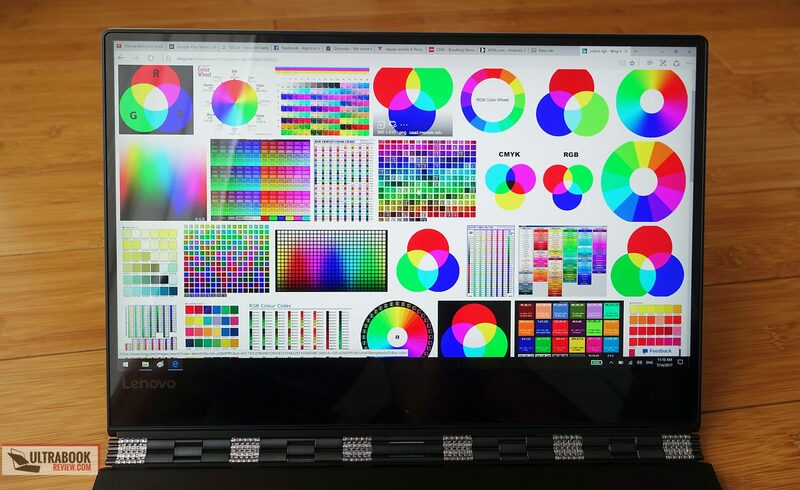 What's the resolution of that monitor? 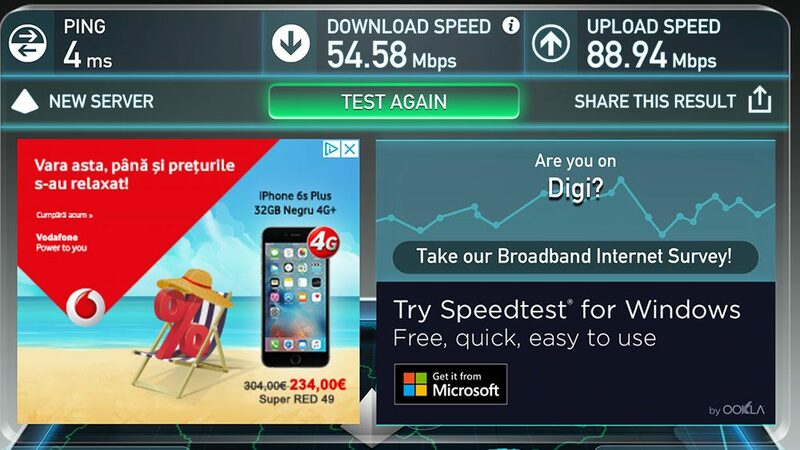 Normally you'd need an USB-C to HDMI adapter and then hook the monitor with an HDMI cable (search for USB-C to HDMI adapter on amazon and pick something with good VERFIED reviews), but if it's high-res you might only get it to work at 30 Hz.